Getting a tattoo is a big decision, so it’s important that you’re in good hands. The talented artists across Arknasas are more than equipped to do the job. Their masterful and creative work is sure to impress. No matter what you’re looking for, you’ll find your dream design at the 10 best tattoo parlors in the state. Some of the best tattoo artists in Arkansas make their home at Diamond State Tattoo Parlor. A clean, modern space, Diamond State is “clean enough to bring your mother to.” Once you see what they’re capable of producing, you’ll come back time and time again. Lucky Bella Tattoos in the Maumelle section of North Little Rock is a small, mom and pop—so to speak—shop. But their ink work is awesome and has been featured nationally. The shop’s experienced artists can do any type of custom work you’re looking for, from neotraditional to portraits. With more than 15 years of ink experience under her belt, Crissie Clegg—the proprietor of True Grit Tattoo Parlor—has been responsible for much of the walking art in Fort Smith for quite some time. She specializes in tattoos in an illustrative style, as well as cover-ups when you’re ready to upgrade your ink. 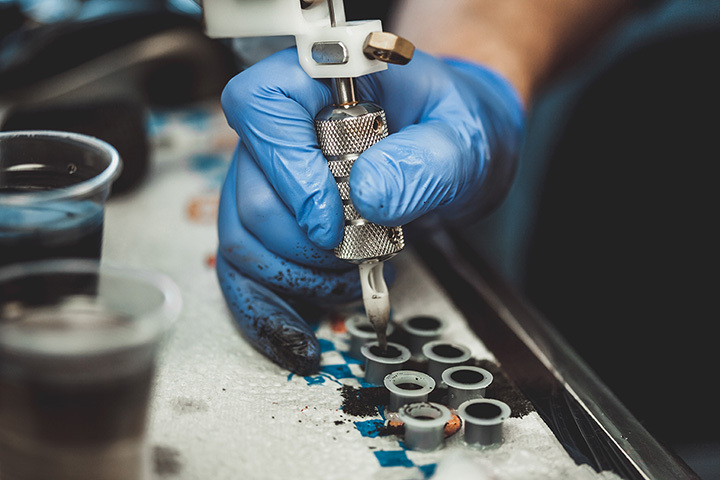 With nearly two decades of tattoo experience, as well as significant piercing experience, in the studio, Legacy Tattoos and Piercing is easily one of the state’s most respected shops. They’re artists’ abilities range from traditional to photorealism and cover-ups. Clearly, custom tattoos are always on the menu. For the last six years, ENvisions has kept the ink flowing in Conway. No matter what kind of ink you’re looking for—a custom, multi-session backpiece or flash art from the book—the artists at ENvisions can accommodate you with professionalism and skilled hands. Several artists, adept in all forms of body modification—from ink to piercing— make Anchor Tattoo & Piercing in Bryant one of the state’s favorite ink shops. From selves and backpieces to book art or any kind of custom ink you can imagine, Anchor can get it done. You can go to Hot Springs to visit the national park, enjoy all that the Natural State has to offer or get some top-notch ink work done at Spa City Ink. Whether you’re looking for the latest in Santa Muerte designs or your favorite college emblem, Spa City will make sure that your showpiece will be conversation starter for as long as you show it off. On the national scene, thanks to the show “Ink Masters,” Black Cobra Tattoos may be the most respected tattoo studio in Arkansas. Two of their experienced team of talented, award-winning artists appeared on the show at the same time. Locally, though, their artists create tattoos on a custom basis, ensuring that the art becomes a natural part of the client’s body. Southtown Tattoo & Body Piercing Studio has five full-time artists on staff. With such a depth of talent, you’re almost sure to be able to get anything you can imagine inside on your body. If you’ve got the stamina, they also offer the “Tap Out Special”—you get a tattoo artist all to yourself for a full day. Or as long as you can take it. Folks in Fayetteville who are looking for incredible ink need not search beyond Brainstorm Tattoo & Piercing Shop. Their team of talented artists will ensure that your vision for your body is all that you hoped it would be. From skulls and symbols to sleeves and sayings, Brainstorm can hook you up.